Steven Spielberg’s The Post doesn’t feel like a Spielberg film. Had I not known it was a Spielberg film I would not have been able to tell from the visual clues. I say this because had the film not been touted as the work of it’s director I’m not sure it would have been in the running for the Oscar. 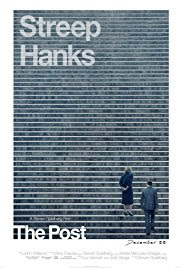 Don’t get me wrong The Post isn’t a bad film, it is a good film. It simply isn’t a great film. Basically it’s a film where nothing happens until one guy makes a guess he knows who the leaker is and makes a call. Then they argue if they are going to publish or not- which is generates no suspense since we know they did. The problem with the film is it’s all over the place. We don’t get to know Daniel Ellsberg who is an interesting character and are instead focused on Mrs Graham who flounders around in running the paper until she makes a stand. Its nice but it a wishy washy story. As for the newsroom story nothing really happens since its Bradley and crew watching the Times, as one guy makes a few calls and gets the papers. Even the arguments about publishing are not really tense because they are so bland we can’t forget that they did publish. I enjoyed it but this isn’t a film it’s a polemic. Its Spielberg and crew standing up against Trump. I’m all for it but there is no weight except the weight of the moment. It’s so light I don’t know if the film will stand up when Trump leves office- even as a portrait of Mrs Graham. Worth a look but don’t expect Oscars.